Sometimes life calls for a special treat, especially when you want to acknowledge that your kiddo has done well. I'm one of those moms that actually likes to sneak special treats in my kids lunches, and sometimes their backpacks for them to find at school. Just my way of saying "you're special" and I'm thinking of them. Plus it's always fun to hear what they thought about their treat when they get home from school. 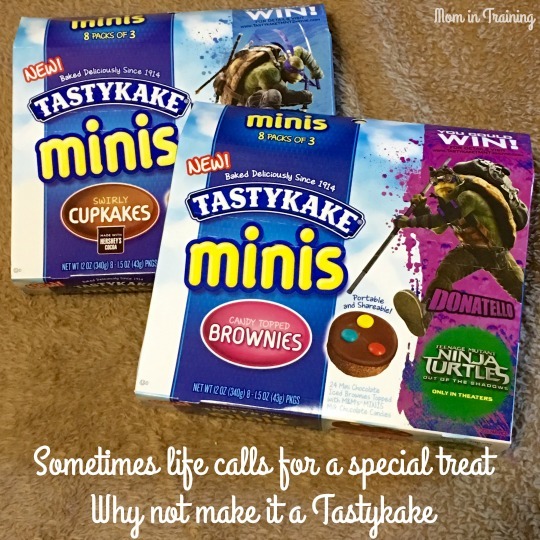 Recently Tastykake came out with a new line of mini cupcakes and brownies that are actually the perfect size for a special treat in your kiddo's lunchbox. Of course they are a nice reward for a mom's job well done taking care of her family too. I know this mom has enjoyed a few of them since the boxes arrived a few weeks ago. I'm actually really looking forward to trying out their Mini Koffee Kake Cupcakes because I'm a big fan of coffee cake. Sounds like a great morning on the sort of treat to me. Tastykake's Mini Cupcakes and Brownies are perfectly portioned desserts coming in at under 200 calories per pack, giving lunch boxes everywhere a dose of sweetness. These treats come in three bite-sized pieces per pack, making it easy to share with friends and spread the love. These look good! I'd love to try the Mini Chocolate Peanut Butter Cupcakes. Yes, I want the Mini Chocolate Peanut Butter Cupcakes, too. Chocolate and peanut butter go so well together.